Religion has played a major role in both the division and unification of peoples and countries within Africa. Its capacity to cause, and to heal, societal rifts has been well documented. This book addresses this powerful societal force, and explores the implications of a theology of reconstruction, most notably articulated by Jesse Mugambi. This way of thinking seeks to build on liberation theology, aiming to encourage the rebuilding of African society on its own terms. 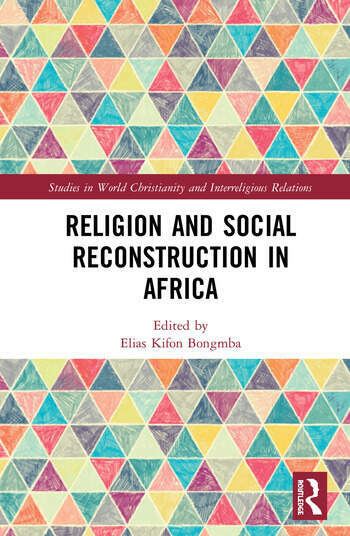 An international panel of contributors bring an interdisciplinary perspective to the issues around reconstructing the religious elements of African society. Looking at issues of reconciliation, postcolonialism and indigenous spirituality, among others, they show that Mugambi’s cultural and theological insight has the potential to revolutionise the way people in Africa address this issue. This is a fascinating exploration of the religious facets of African life. As such, it will be of great interest to scholars of religious studies, theology and African studies. 13 "… Then Towards the Rebuilding of Our Societies Now in Ruins"
Elias Kifon Bongmba is Harry and Hazel Chavanne Chair in Christian Theology and Professor of Religion at Rice University, USA. He is author of The Dialectics of Transformation in Africa. He is Managing Editor of Religious Studies Review, and President of the African Association for the Study of Religion.